No matter what moves you’re making, the SandBell moves right along with you. Working your core, challenging your muscles and pushing your stamina—simultaneously, and with one, mighty piece of sand-filled neoprene making it the ultimate sandbag. It is also the best new piece of sports equipment in the PE Universe for school athletics or physical education. Engineering this powerhouse of a workout product was no small task. The Hyperwear SandBell, at its most basic level, is the combination of strengths from some of the most popular pieces of fitness equipment. Its outer shell, made of tough, stretchy neoprene, contains a sand-filled core that can be easily emptied and filled using Hyperwear’s patent pending fill mechanism. The filling mechanism not only makes filling and emptying simple, but also saves you money. Purchase empty SandBells, fill them with your dry playsand and save on shipping. Use the SandBell in place of a medecine ball, D Ball, dumbell or kettle bell and prepare to work muscles you didn’t even know existed. The active, shifting movement of the sand challenges stabilizing muscles in your core. When working out with the SandBell, you will engage hand and wrist gripping muscles that are typically not activated and strengthened. Another advantage of this product lies in its safety for you and your floors. A favorite alternative to dyna max, jerry can, sand bag, and d-balls for crossfit box WOD, outdoor bootcamps, military and football training equipment use. On a slick floor you can use SandBells for a variety of ab coaster and glide or sliding core exercises. SandBell sizes range from 2 to 50 lbs. Purchase in pairs for dumbbell sets, single weights for dynamax medicine ball training, or kettlebell exercises. No large medicine ball or mini medicine ball can compare. The thick, neoprene shell is stretchy and soft to the touch, but is not short on durability. Pricing makes these cheap medicine balls. 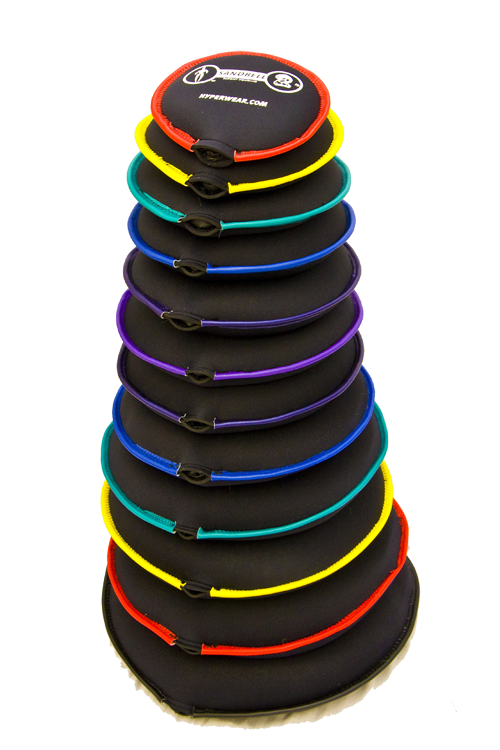 The Hyperwear SandBell is available in the following weights and colors. For those opting to purchase the SandBell empty, you can buy a funnel on our website, or at an auto supply store or department, to help fill your new SandBell. Empty SandBell weight is approximate, as you can determine your own amount of fill, making the SandBell more solid or squishy. We recommend that you purchase DRY WASHED play sand to fill your SandBell with. The best we have found is the 50-pound bags of Quickcrete Premium Washed Play Sand, which is available at most major home improvement stores, and be sure to check the bag closely to make sure that the sand is in fact dry!